Is it just me or do you sometimes get sick right before a big event like your Caribbean vacation? Or find yourself doubled over from the stomach flu the day before an important presentation at work? Even though we can’t control which viruses or bacteria latch onto our bodies, we can give our immune systems a better chance at preventing some illnesses before they strike. I’m talking about eating a healthy balanced diet every day, not just when you feel you may be coming down with something. If we eat nutritiously more often than not, when we’re stressed and overworking our bodies, our immune systems will have the right vitamins and nutrients to keep us healthy during skipped meals and crazy sleep schedules. 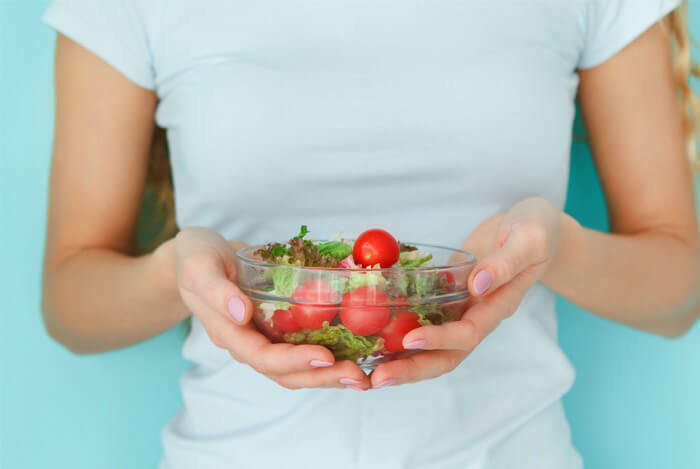 Eating well isn’t just about weight loss, it’s about making your body healthy. I completely believe that good nutrition and good health are intertwined. A nutritiously sound diet basically does everything you’d ever want food to do for your body. Good nutrition stems from a diet that includes a specific balance of lean protein, complex carbs, and just a bit of healthy fat. But even if you’re getting the right amounts of healthy foods, you may still be missing out. You may think you’re switching up the foods you eat because you have a different flavor of overnight oats every day, or vary up your pasta sauces, but think again. The truth is, we kind of get stuck in our ways when it comes to nutrition. Even if you’re choosing whole wheat pasta and whole grain bread, you’re still only eating from one grain family: wheat. But I’ll admit I’m guilty of not following this advice; when I discover a healthy food combination, I like to stick with it. Let’s take a quick dinner of mine as an example. A serving of kale is an amazing source of vitamin C (a whopping 134% per cup! ), but it doesn’t have as much protein as say, a serving of salmon (39 g protein). So I routinely combine these two foods to make sure I’m getting enough vitamin C and protein in my diet. But I do know I can’t get locked on good-for-you combinations like this. Using our example, other strong vitamin C/protein combos include: roasted orange chicken, tempeh and grilled red peppers, or even Icelandic yogurt and kiwi (skin on!). Just by swapping different versions of the same healthy benefits (vitamin C and protein), my diet now includes vitamins and nutrients from different fruits, veggies, and protein sources. It’s easy when you think about it, but that’s the thing…you need to be conscious of it. This isn’t as easy as it sounds and sometimes means forgoing your easy standby recipes once in awhile to try something new. But hey, eating different foods can be an exciting part of a boring work day. It’s also a great way to teach your kids about new foods they may want to eat more of. A good way to incorporate variety is to eat by the color wheel; different colored fruits and veggies contain different types of vitamins, nutrients, and antioxidants. 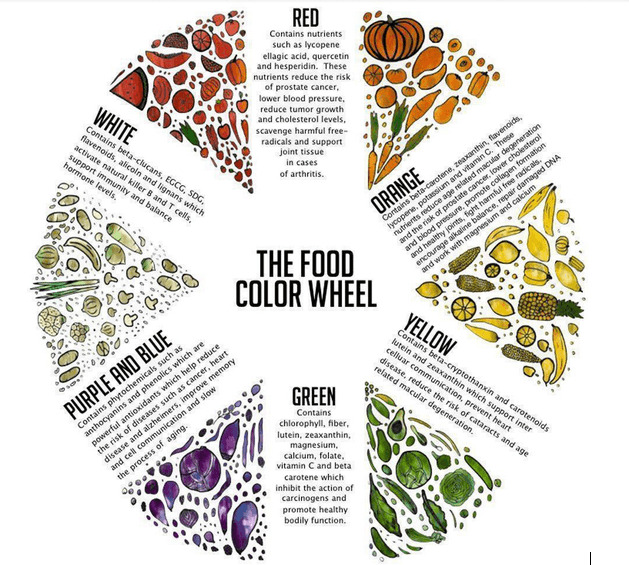 Try to eat food from every color at least once a day, or once a meal if you’re trying to be a nutrition all star. You can think of dietary fiber as carbs your body can’t digest. 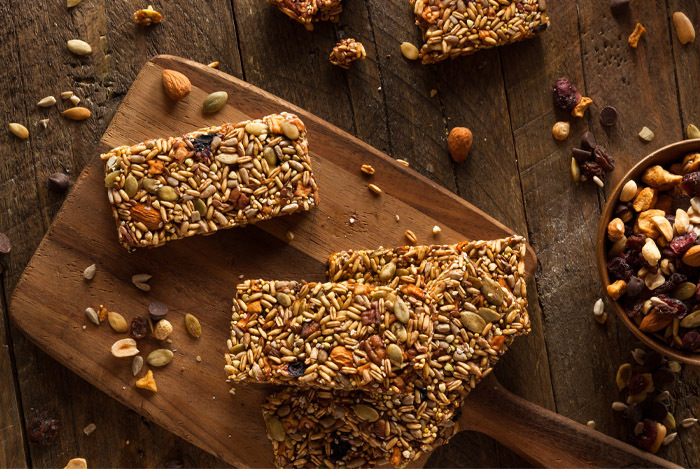 Fiber helps keep our digestion in peak condition by moving everything along nicely. See, when fiber swells up during digestion, it slows down the time it takes for our bodies to process nutrients on its way through. It also lowers cholesterol, and since it makes us feel fuller longer it helps keep our weight in control. So with that information in mind, have you been getting enough fiber? Most people top out at 15 grams of fiber per day on average. The daily fiber recommendation is 30 to 38 grams a day for men and 20-25 grams a day for women. That’s a LOT more than what most people are consuming. People who don’t get enough fiber become more prone to health issues like constipation, painful hemorrhoids, weight gain, high cholesterol, high blood sugar, lower immune system responses, and even cancer. Vegans and meat-eaters can all agree that our bodies need protein to survive. 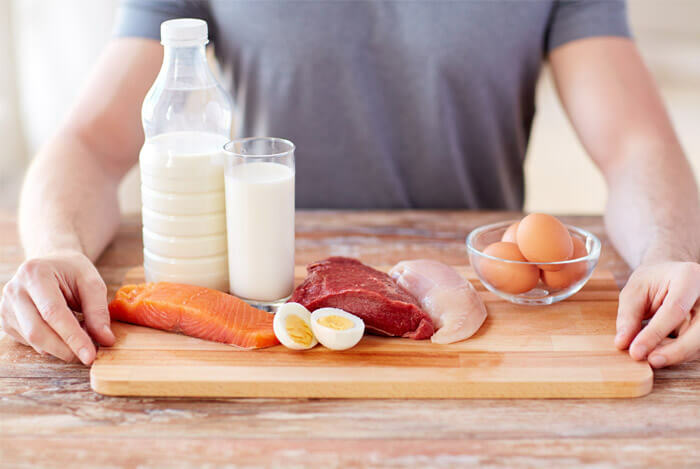 You can get healthy protein from meats, poultry, fish, dairy, nuts, grains, and lentils. 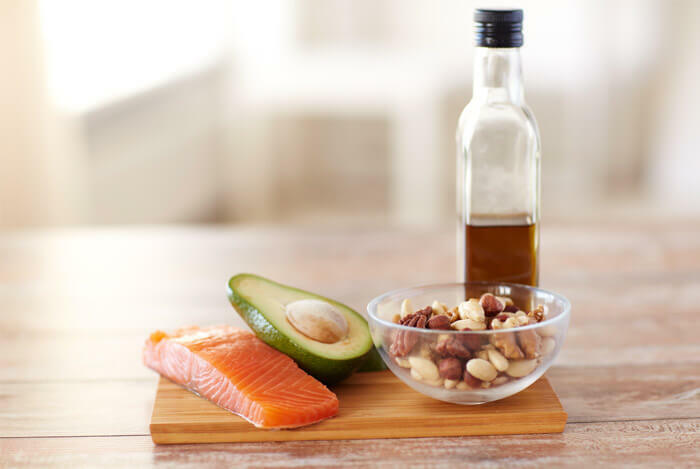 Your balanced diet should include a small amount of healthy fats. By focusing on getting enough omega-3 fatty acids, you’ll actually start strengthening immune cells. Now, I’m sure you’ve been told to load up on vitamin C during cold and flu season, and eat yogurt everyday for good digestive health. But there are a lot of other foods out there that will also work their magic to keep you in tip-top shape. By incorporating some of these foods, you’ll see just how quickly good nutrition stops you from getting sick. 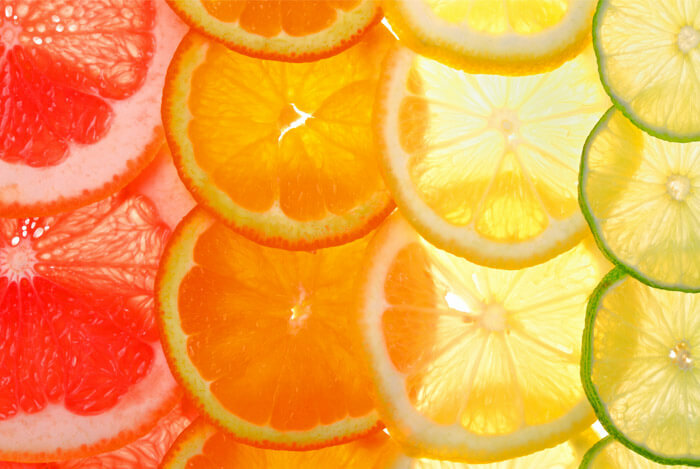 Like I said, we all know that the vitamin C found in citrus fruits and juices is a master at immune system enhancing. But are you getting enough? Make sure you eat foods high in vitamin C every day. 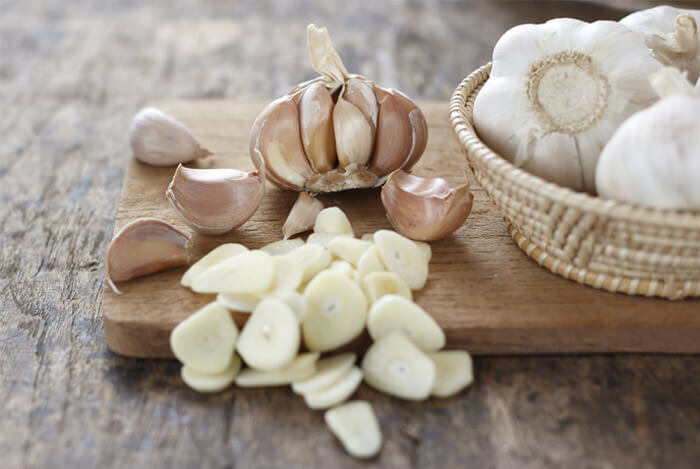 I always prefer adding garlic to my dishes instead of salt; I feel like it provides just enough flavor to keep me from having to reach for the salt shaker and raise my sodium levels. In one study at the University of Maryland Medical Center, participants who took garlic supplements for 12 weeks during cold season had fewer colds than those who took a placebo during the same time. And when the garlic participants did get a cold, they “saw their symptoms go away faster than those who took placebo”. 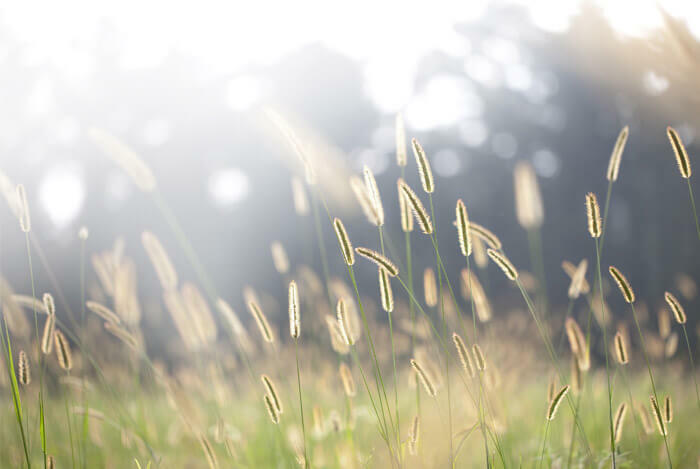 Remember when we discussed how to fight off candida infections with probiotics? Well, by eating live active cultures such as Lactobacillus acidophilus, Lactobacillus bifidus, and Saccharomyces boulardii, you’ll build up a higher resistance to bacteria that causes food poisoning. Research suggests that probiotics may prevent or slow the rate of infection completely. Probiotics help good bacteria in our bodies multiply, and those swarms of good guys crush all the bad bacteria. 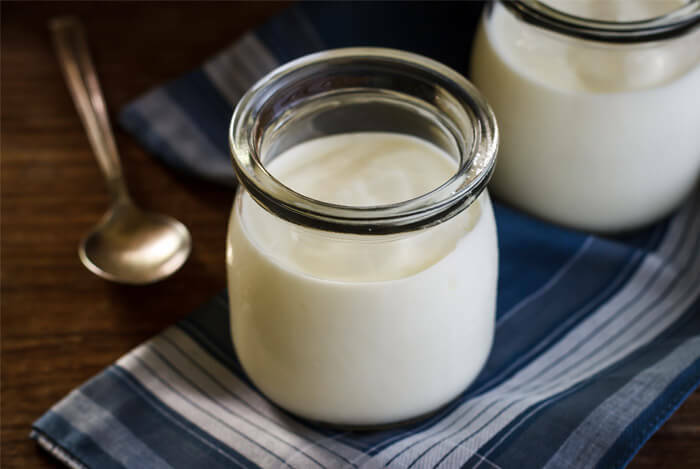 By regularly consuming plain yogurt and kefir (make sure there’s not a ton of sugar! ), you’ll be on your way towards fewer yeast infections, UTIs, diarrhea, and really bad colds or flus. The old standby for all icky related illnesses, chicken soup seems like the wonder-cure of them all when you’re feeling like you may get sick (or already are). Warm and comforting like the coziest blanket, researchers at the University of Nebraska Medical Center tested a traditional chicken soup for it’s ability to reduce inflammation of the respiratory tract and halt the spread of congestion-causing white blood cells called neutrophils. They discovered that “all of the vegetables present in the soup and the chicken individually had inhibitory activity”. This means that one cup a day worked to produce a “mild anti-inflammatory effect”, which could “result in the mitigation of symptomatic upper respiratory tract infections”. 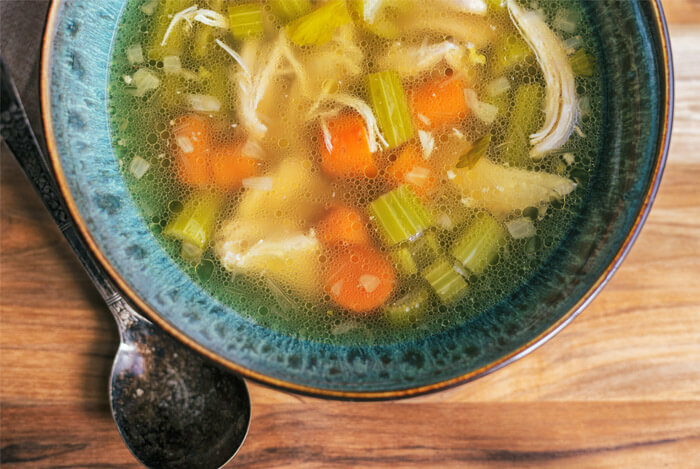 Sounds like inflammation and congestion won’t want to be stuck in a dark alley with chicken soup. Be careful though, researchers found that commercial soups varied significantly in their inhibitory activity. But fear not! Here’s the official Grandma’s Chicken Soup recipe they used. 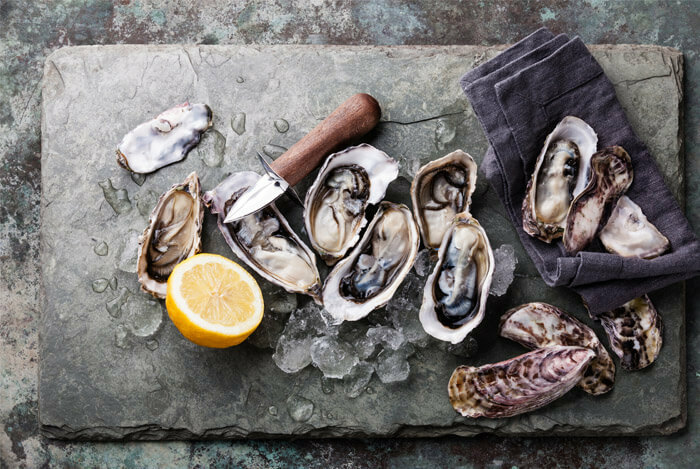 You can find this awesome antioxidant in lots of food sources; meat, poultry, spinach, oysters, pumpkin seeds, beans, and nuts all contain zinc. Zinc has been shown to stop the growth of microorganisms like bacteria and viruses in our bodies. And a reduction in growth means a decrease in infections. But if you do happen to get a cold or infection, studies show that zinc’s powerful immunity boosting effects may help shorten the duration of a cold, and may actually stop the cold cells from multiplying. I’m not surprised that we usually get colds and flus in the months we spend the most time indoors, far away from where vitamin D, the sunshine vitamin thrives. One study determined that having low levels of vitamin D increases your risks for developing colds, flus, and respiratory infections. So if you don’t spend a lot of time outdoors or eat lots of vitamin D rich foods, you could have a truly miserable cold and flu season on your hands. To help you out, make sure to get your RDA of vitamin D in milk and cheese products, eggs, and fish like tuna, salmon, and swordfish. During the summer months, try some spf-protected sunbathing to enjoy absorbing your vitamin D instead. 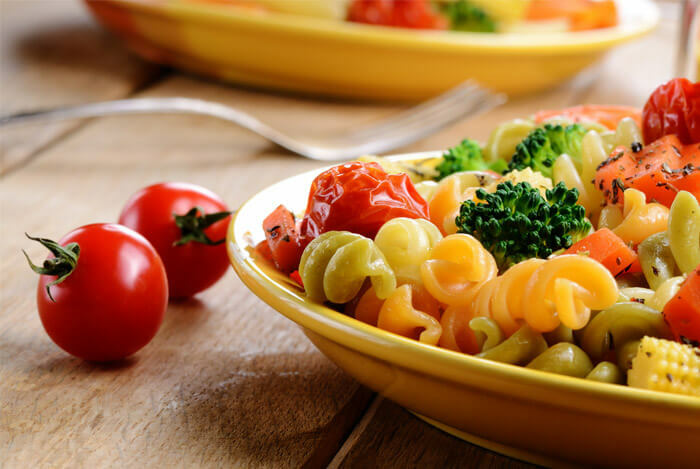 By making sure to incorporate a variety of vitamins and nutrients with healthy amounts of complex carbs, proteins, and good-for-you fats, you’ll be giving your body premium food fuel. And it will certainly start running better because of your choices. What’s your take on boosting your immune system through diet? Have anything else you’d like to share? Let me know in the comments below!